The Lego Movie 2: The Second Part continues the winning formula that made the first one successful. Goofy wordplay, rainbow Skittles visuals, and wholesome family themes are feel-good entertainment. There's also a fair amount of singing, which is thankfully funny and clever. My gripes are a few constants I see in the Lego film universe. Every shot is just too busy. Coupled with the firehose delivery of the plot, the film feels like a two hour sugar rush. Five years later in The LEGO Movie 2, Finn (Jadon Sand) is now a teenager with dibs on the basement. He gets annoyed when his fawning sister (Brooklynn Prince) touches his prized Legos. Meanwhile in Bricksburg, events have taken a downward turn. Wyldstyle (Elizabeth Banks) is unnerved by Emmet's (Chris Pratt) happy go lucky, positive nature. The bubbly, "everything is awesome" builder wonders if he needs a harder edge. Their personal feelings are sidelined by a cutesy alien invasion. Queen Watevra Wa-Nabi (Tiffany Haddish) and her Duplo army attack from the Systar System. Emmet springs into action to save his friends. He quickly finds an ally in the "totally extreme" and rugged Rex Dangervest. Meanwhile, the shapeshifting queen has different intentions with a prima donna captive (Will Arnett). Both sides leading to a dreaded showdown, Ar-mom-ageddon. Phil Lord and Christopher Miller's screenplay is a whimsical take on sibling rivalry. The directors of the original return to produce and gleefully poke fun of pop culture. I particularly like their spin on the Justice League characters. Batman's fascination with his shredded abs and competition with anything Superman is hilarious. The film slyly nods and winks to the spin-offs in the franchise. The visual effects explode with color and crisp definition. The Lego animation focusing on a more feminine perspective. We'll see how Legos for girls sell after the film's release. Queen Watevra Wa-Nabi's character stands out as an accomplishment. She's a shapeshifter that transforms throughout the film, but doesn't look like a Disney princess. The queen is a set of sassy building blocks. There's some creativity to her look. I do wish that the animators would dial down the background action. This hyperactive approach can be exhausting to see. 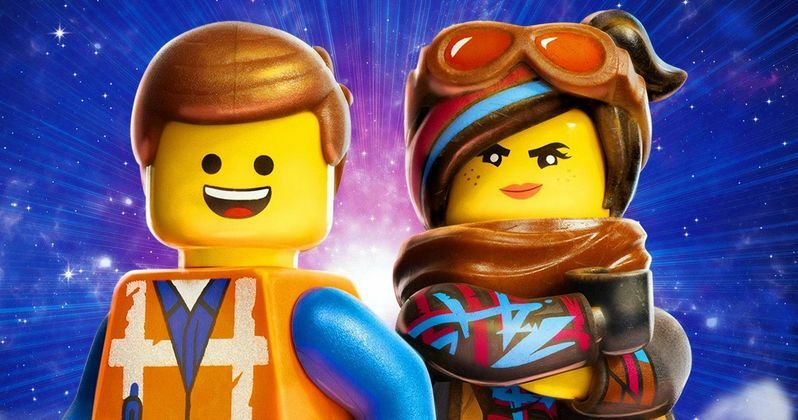 The Lego Movie 2: The Second Part deserves a nod for big laughs across the age spectrum. It's a kids movie with nothing remotely risque. Lord and Miller serve up a sweet tale of kindness and reconciliation. It never gets sappy, or too dark. The live action scenes offering a welcome break into reality. The fantastic Maya Rudolph is a scene stealer as the mother. She's hardly in the film, but funny and endearing as always. The Lego Movie 2: The Second Part is a bright and syrupy, family values sequel. Warner Bros. can expect another Lego box office hit. I'm personally looking forward to a Lego Batman sequel. The Dark Knight gets a fabulous makeover here.